In the modern world, more and more documents and services are made available in digital format. Even if it can be a source of huge progress for all humankind, this phenomenon often happens through technologies which become obsolete in a few years, are incompatible with each other or cannot be afforded by everybody. This fact creates serious obstacles to a really free communication among people, to the preservation of the cultural and spiritual heritage of humankind and to the diffusion of the Word of God. The paragraph above is the introduction of the Eleutheros Manifesto that I and other Catholics wrote almost seven years ago. Today, February 28th, 2013, Pope Benedict’s last meeting in Vatican provides a perfect example of those obstacles we were, and remain, worried about. Because not everybody can follow it online, not from its source at least. 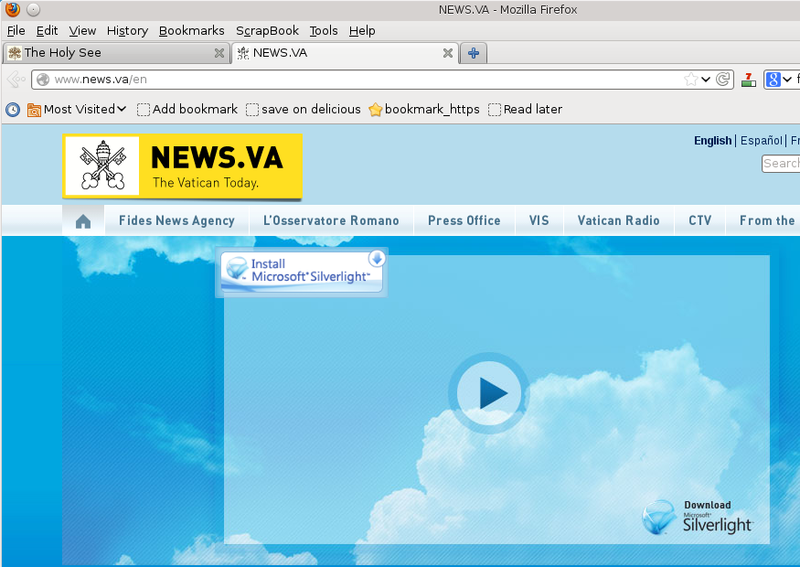 News.Va, instead, is the online News Portal of the Vatican. Neither of those two websites allows universal vision of today’s and other Catholic events, because they adopt a technology that only works on certain browsers and software platforms. By doing so, they exclude, without any real need, all people, Catholic or not, who for any reason cannot afford those specific systems, or may have plenty of other valid reasons to not use them. Regardless of which software is adopted, only Open Formats and Protocols are used, by all Catholic Organizations to store or manage any kind of digital data, like for example text, images or music. Only this can guarantee that all digital documents are completely accessible to everybody, including those who cannot afford state of the art computers or the purchase of proprietary software, and above all that such documents remain available forever. I hope this day will also be, for all Catholics, an opportunity for reflection on that and other suggestions in the Manifesto.